I recall seeing a description of this anime somewhere a few years ago and nothing jumped out at me as something I would enjoy (in fact, I thought it sounded kind of strange at the time), so I passed over it. Looking back on it now, I think the description I saw just might not have been written well. Recently, Crunchyroll picked up a license to stream it in North America, and the description jumped out at me a little bit more. Since it was free, I figured I’d watch the first episode and see what it was like. It hooked me, and I ended up watching the entire series over the following four days. Although what Crunchyroll is streaming is Japanese audio with English subtitles, I noticed that all the credits were in English, and they had an English vocal cast listed in the credits in addition to the Japanese vocal cast. This series really jumped out at me as something my kids would probably enjoy as well, so going on the clue from the credits that there must have been an English version, I checked out amazon.com and sure enough, found a box set of the series in English. 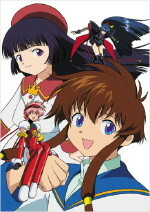 The premise of the series revolves around a game in which the participants buy high tech electronic doll kits, design the dolls (called “angels”) and outfits for them, and then fight them against each other on a playing field (called “the layer”) which allows the player to control their angel via a headset that transmits their thoughts to their angel. You win the game by having the most remaining points at the end of the 10 minute time limit, taking away all of your opponent’s remaining points, or by getting a “layer out” by knocking your opponent off the layer. The game tables are expensive, so most people don’t own their own, but rent time at a table in local establishments resembling cyber cafes to practice or have games with each other. If the technology really existed to do this, it would be incredibly fun to participate, I think. The actual fights seem pretty similar in concept to the “net battles” in Mega Man NT Warrior (but no weapons, it’s all hand-to-hand combat), which my kids really enjoyed, and was why I figured they’d enjoy this, too. The dolls only work when on the table used for the playing field, and it reminded me of the “dimensional area” concept in Mega Man NT Warrior that allows the net navis to come into the real world, but only within the dimensional area. The series opens with the main character, Misaki, moving to Tokyo to live with her aunt Shoko. Her father died when she was a baby, and her mother left to go to Tokyo to work when she was 5, and never came back, leaving her with her grandparents in the country for the last 7 years. The directions she gets from her aunt for how to find her house have her changing trains at Tokyo Station, getting off the regional bullet train onto the subway to get further into town. But she gets lost inside the station and accidentally leaves the station instead of going to the transfer area, meaning she would have to pay for a new ticket to get back in. In the square in front of the station, an Angelic Layer game is playing on the TV above the square. The eventual winner of game is a small white angelic-looking doll, who comes from behind to win against a larger opponent. Misaki, being fairly small herself, becomes very enthralled with this, that someone smaller could beat a larger opponent. It’s then that a man in a white lab coat (who had actually followed her out of the station) approaches her and offers to show her how to get involved. She eventually makes it to her aunt’s house, but not before spending all her money buying an Angelic Layer doll and accessories. Having no money left to buy a new train ticket, and the guy in the lab coat having disappeared (he had gotten detained by the store security because of a misunderstanding with a store worker) she ends up walking all the way to her aunt’s house. The following paragraph describes some of the plot points revealed later in the series which helped to define the series and created much of the drama and tear-jerking moments in the series that won me over. Since they’re crucial plot developments, I’ve marked it with spoiler tags to avoid spoiling the show for anyone who wants to discover them on their own. We eventually learn that her mother (Shuko) really has multiple sclerosis, and has lost the use of her legs. The real reason she left home was to participate in research to try to help her walk again, and she’s embarrassed to be seen by Misaki in a wheelchair. She and one of the doctors (Icchan) had been working on neural transmitters to allow a user to control prosthetic legs in a natural way so that they would behave like normal ones. The research was promising, but not promising enough for the bosses at the medical equipment company Icchan works for, and the funding had been cut. Not wanting to give up, Shuko and Icchan turn to merchandising the small dolls they had been using to test the transmitters as a game in order to make money to continue the research on their own, and thus, Angelic Layer is born. It took off way faster than they anticipated, and much of the research ended up getting channeled towards improving the game. Shuko is the one who controlled the small white doll Misaki had seen on TV at the train station. The man in the lab coat who found Misaki at the train station turns out to have been Icchan. He had been sent there to make sure Misaki changed trains correctly, but failed to make contact in the station and lost track of her until after she’d already gone out the front gates. Seeing her interest in Angelic Layer in the square in front of the station, he had decided it might be a good way to get the mother and the daughter to meet, since Shuko was still too paranoid to let Misaki see her in a wheelchair. Icchan and Shuko’s sister Shoko (who Misaki is now living with) try many times to convince her to go see Misaki, but she never gets up the courage to do so until the end of the semifinal match at the national tournament, with Misaki not even knowing that her mother is involved with Angelic Layer at all (let alone the co-creator of it and current national champion) the entire time. After a tear-jerking reunion before the final match, Shuko and Misaki get to battle each other for the national title. Throughout the 26-episode series, we learn a lot about the background stories of several of the other players, and many of them become good friends with Misaki as a result of their interactions in the games. There’s even a touch of romance thrown in. The end of the series is really touching, and if you’re the empathetic or emotional type, I guarantee you’ll come out of episode 25 shedding at least a few tears. I said at the top that I found DVDs with English audio on them. I did order them but they haven’t arrived yet as I type this. I made the mistake (if you want to call it that) of letting my son (he’s 10) watch the first episode in Japanese with subtitles online, and sure enough, he got hooked too. He may have the entire thing watched in Japanese before the DVDs show up for him to be able to see it in English. Bottom line, my son and I both really enjoyed this series. The intended target audience is probably kids about my son’s age (upper elementary). You can watch it online for free at Crunchyroll if you are connecting from within North America (in Japanese with English subtitles). Paid subscribers get full DVD quality (480p), non-subscribers will get a lower-resolution (but still perfectly watchable) version. The DVDs (with English audio) are available at Amazon.com (and probably other places).